Cheryl was recently pictured inside a London airport while trying to shield her mouth from the paparazzi cameras, but not before this shocking image was taken, revealing what clearly looks like over injected collagen lips. This is the first time that Cheryl Cole has been the subject of plastic surgery rumors, and her reps quickly came to her defense, saying that she has “definitely not” had any work done. Sounds like what any good representative would say about their client, but this before and after picture tells a much different story. 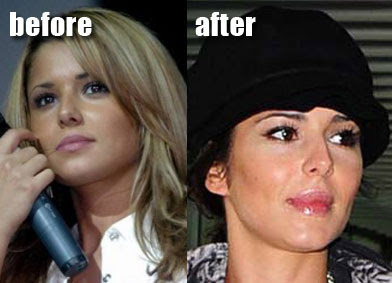 A story of celebrity collagen trout pout lips. Seriously i wanna know who you are. you need to seriously consider other things like the fact her lips are smothered with lipgloss. Moron, if you see the other pictures taken that day, she looks totally fine. The press just found an unfortuate picture and ignorantly ran this story.